Boats glide past the Cape Lookout Lighthouse. The ranger on the gallery welcomed the family to the top of the Cape Lookout Lighthouse, 150 feet above ground. At this elevation, where birds fly below, you'll find a great view of the dangerous shoals jutting into the Atlantic Ocean — the reason for building the lighthouse in the first place. This area of the North Carolina coast is called the “Graveyard of the Atlantic,” where shallow shoals, reach into the ocean like fingers on a hand to mix with ocean currents, making the coastline a precarious place for mariners. More than 5,000 ships are said to have wrecked along this coast, giving it its deadly reputation. With the completion of the second Cape Lookout Lighthouse in 1859 and numerous others in the area, the coastline became much safer and easier to navigate. Grateful mariners frequently gazed upon Cape Lookout Lighthouse with a great sense of relief knowing that they would once again make it past the treacherous shoals. 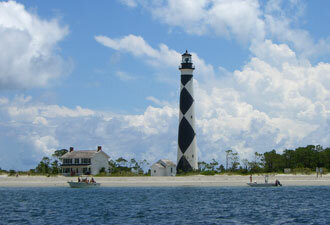 The Cape Lookout Lighthouse was a major focal point for seagoing vessels in the past. Today it is a fascinating destination for visitors. Thousands of people make the thrilling trip by boat each year to visit the Cape Lookout Lighthouse — to relive the life of a lighthouse keeper, and to enjoy breathtaking views of the pristine, undeveloped seashore of these barrier islands. After walking a couple of the 56 miles of undeveloped shoreline, the little girl shrieked with joy as she watched a piping plover chick chase after its mother. 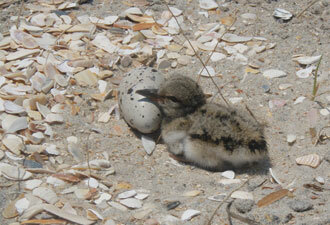 The barrier islands provide productive nesting habitat to multitudes of shorebirds including the elusive Wilson's plover and the aerobatic black skimmer. Spring and fall can bring numerous species of migrating birds, as Cape Lookout is part of the Atlantic migration flyway. The tranquility produced by the rhythm of ocean meeting spreading sand invites creatures of all kinds to investigate the seashore. Visitors can enjoy the warm sand between their toes as they hunt for treasures spit out by the sea. Pristine beaches can supply the dedicated seeker with some of the best seashells in the state, including the North Carolina state shell, the Scotch Bonnet. The sea offers solace and rejuvenation for some. For others it provides a bounty of marine life including fish of all sorts. Recreational fishing enthusiasts can spend hundreds of hours trying to catch that record-breaking fish in some of the finest waters in the state. Cape Lookout National Seashore offers outstanding opportunities to get outdoors and be active; kayaking, surfing, boating, swimming, and beach camping are hugely popular. Being able to wake up to a beautiful sunrise on a remote beach is a memory that will last forever. As the girl settled into her mother's lap for the ferry ride back to the mainland, she shouted “Mommy , I see one” and pointed to one of the majestic Shackleford Bank horses. 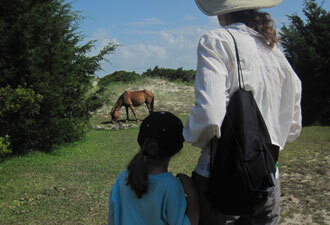 Wild horses have survived on these islands for hundreds of years and continue to enthrall visitors with their grandeur. Cape Lookout National Seashore provides activities that meet visitor interests from maritime history to bird watching, from saltwater fishing to relaxing on the beach. Spending the day at Cape Lookout National Seashore can enhance anyone's vacation — so plan your visit to this exceptional slice of nature.